Our *New Gift Sets are a perfect collection of accessories for any special occasion. 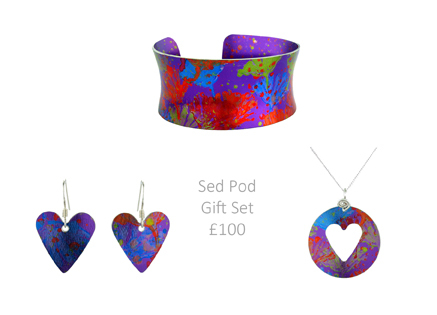 Consisting of a bangle, small pendant and small rectangular earrings in our gorgeous hand dyed anodized aluminium in the Seed Pod colour way. 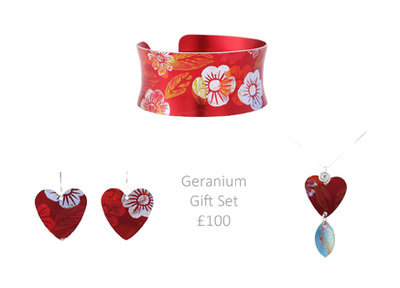 This set makes a fantastic Valentine's, Christmas, Birthday or Anniversary present. 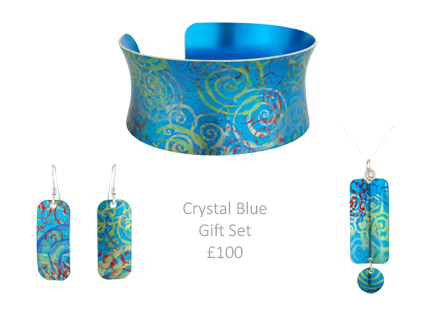 All our sets are presented in a simple gift box. ​Join us and thousands of others this year and choose handmade over mass produced. Not only will your gifts be unique and stylish but almost certainly treasured for years to come. Handmade quality shines through when you buy local or handmade and you can guarantee the highest standards of design and production! Handmade jewellery is more often than not bespoke and one of a kind like each of our individually hand painted, cut and finished anodized aluminium jewellery pieces.